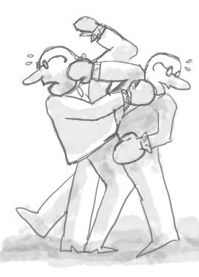 Amazon, Google, Microsoft, Oracle or SAP? Yahoo is “…rebooting its languishing photo-sharing site Flickr…” by giving users a terabyte of storage. Are we storing the right things? Are they all memorable moments? We outline best practice and show you how to succeed with your analytics. Guess what happens in a minute on the web: 204 million emails are sent, 6 million Facebook pages are viewed, and 1.3 million YouTube clips are downloaded (see below). In addition, 47,000 apps are downloaded, and 20 people have their identities stolen. 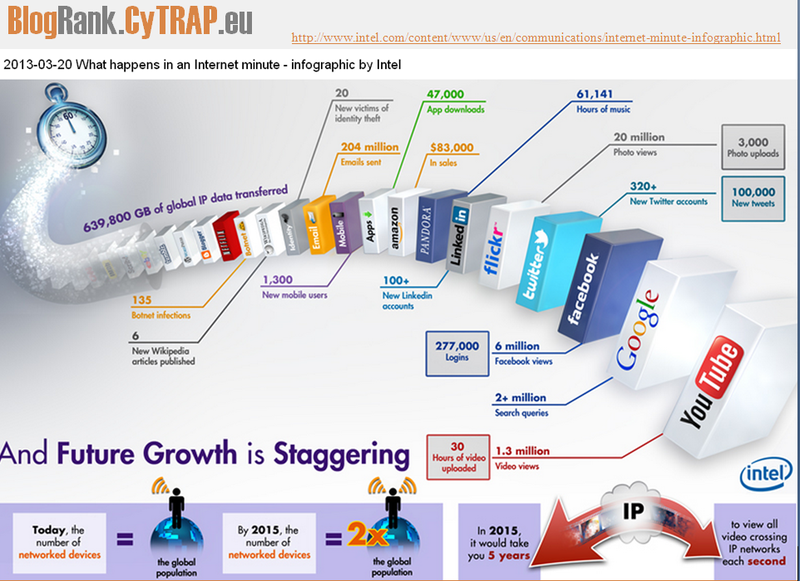 Another study predicts that by 2015 the number of networked devices on the Earth will be double the number of people. The series indicates that we may have more data than we can properly handle – technology is not the issue. Data storage has become dead easy. Flickr recently offered all users 1 terabyte of free storage space in the cloud for their images. Assuming each person’s lifespan is 100 years, this means storing 6250 new pictures each year, or about 17 new images DAILY. Ask yourself, do all those images qualify as so-called Kodak moments? Probably not. Want to manage the data avalanche better? Do what 5,000 other subscribers have done, sign up for our blog – it is FREE! Which data is required for what purpose? Creating a dashboard is certainly not an easy task, especially when it is supposed to be user-friendly and provide useful information. 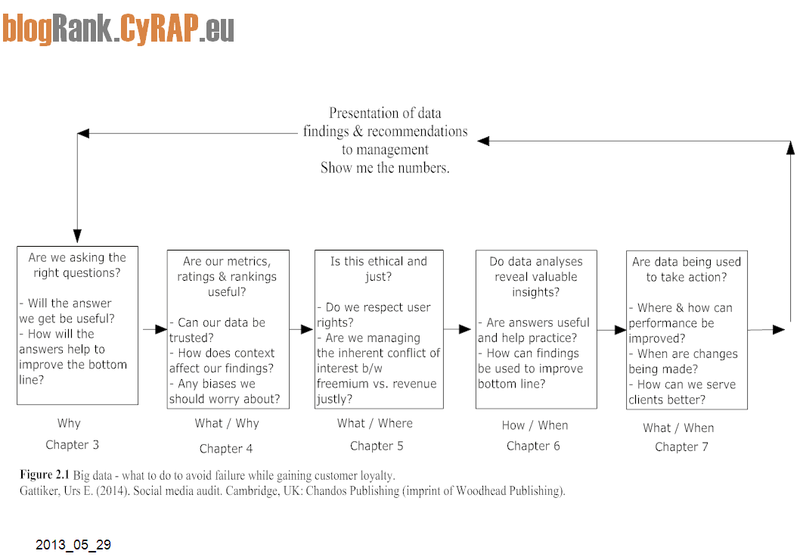 However, for analytics to work properly it is a must to define what we wish to measure and why. How these data will be used, and for what kind of decision-making will also help determine what must be collected. who gets to curate their publication based on points 1 and 2 (e.g., both parents decide together?). Accordingly, unless we come up with a cataloguing system (e.g., a main folder for each year with sub-folders), it will be difficult to find our Kodak moments again quickly. For instance, will we have each day, or each month and each day as a sub-folder? Whatever we decide, we have to look at it from the angle of what makes it more useful (i.e. easier to find the image we are looking for) and explain why. The figure below tries to outline how this can be done, including addressing ethical issues and privacy matters. Will all these data (i.e. 17 pictures of each day of my life stored on line) get us to make better decisions, will we manage risks better or will we just drown in it? Remember easy come, easy go? How do you check if the quality of data used to write a study report justifies the conclusions made by the authors? What do you see as a real challenge with big data? Thanks for reading and commenting! I appreciate you sharing your views. More resources about data bias, Likert scales, parametric statistics, missing values, methodology, etc. – Big data – methodology, research, statistics and parametrics… (just click the URL to query and get some very interesting results – more ComMetrics content). How do you know your data are good enough to let you make the decisions you must? What data-based things do you trust, or not? Any experiences you care to share? 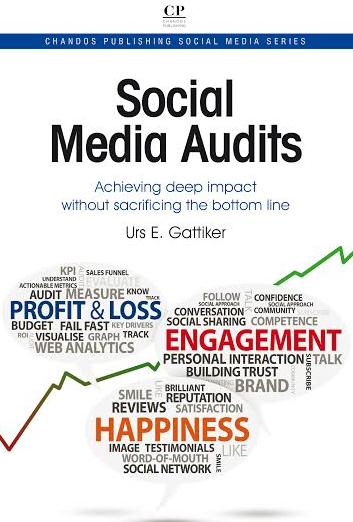 The author: This post was written by social media marketing and strategy expert Urs E. Gattiker, who also writes about issues that connect social media, strategy, ROI and compliance (click Google Scholar or Microsoft Scholar), and thrives on the challenge of measuring how it all affects your bottom line. 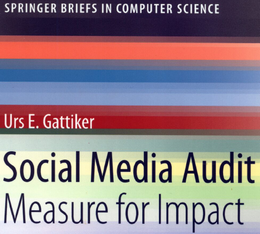 His latest book, Social Media Audit: Measure for Impact, was recently published by Springer Science Publishers; he is currently working on his next book, scheduled to appear before the end of the year. I would say, no. We will store ever more and be ever less likely to recover it on our PC, in the cloud or wherever these data might be. Thanks for sharing. Absolutely, unless we have things tagged with keywords and we remember, how are we to ever find these things. I believe the key is really to figure out what we need these data for and then design a system that makes it easy for us to store/archive information we collect under our scheme. It cannot be that @AmericanExpress:twitter ads on Facebook show up next to repulsive ads violating women’s rights!